Posted on Tue, Apr 10, 2012 : 2:46 p.m. The Ann Arbor Housing Commission is finally turning around and, as of last month, has been removed from a federal watch list after being in "troubled status." 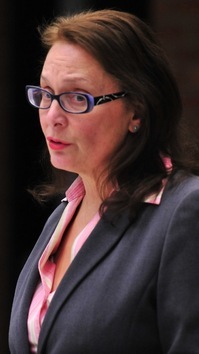 That was the news Jennifer Hall, the Housing Commission's executive director, shared with the Ann Arbor City Council during a work session Monday night. "It has been a very tough couple years," she told council members. "Since 2009, we've had five different executive directors, three managers in our voucher program, six managers in our public housing, and we've had nine other staff turnovers." 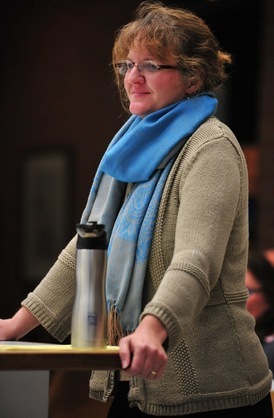 Housing Commission Executive Director Jennifer Hall gives a report to the Ann Arbor City Council Monday night. Added Hall: "It's been very, very difficult, yet we've still been able to come out of that and out of troubled status." The city has spent the last two years trying to reorganize and refocus the Housing Commission, which oversees more than half of the affordable housing stock in Ann Arbor. The Housing Commission has been in a transitional state since 2009 when long-time director Betsy Lindsley retired and the agency was placed in troubled status by the U.S. Department of Housing and Urban Development for its operational shortcomings. The commission was suffering significant budget shortfalls and being in troubled status didn't help. It meant the commission had a higher reporting burden with HUD, was getting less funding and couldn't apply for certain grants until it proved it had improved. Now that the Housing Commission is out of troubled status, Ann Arbor officials are looking forward to more opportunities to seek additional funding, try out new programs, and possibly even redevelop some properties over time. Hall, who previously served as housing manager in the office of community development, was selected by the commission's board in October to replace Marge Novak, who resigned in July. Hall said the Housing Commission is now operating in the black after staff cutbacks, but the 360 housing units it oversees are suffering continued deterioration due to a lack of money. She pointed to an estimated $14.5 million-plus in deferred capital needs. Hall gave a big-picture presentation to council at Monday's meeting, talking about the housing needs in the community and what the commission can do about them. "A lot of our tenants are very high-need and need a lot of support services, and one of the things I was surprised to find out about in working with the Housing Commission is we actually have contracts with seven different agencies that provide various kinds of support services," she said, describing those services as somewhat less supportive than the kinds of services provided by nonprofit Avalon Housing, "but kind of moving that way." The city owns 360 affordable housing units at 18 sites that are overseen by the Housing Commission, including 193 primarily single-bedroom units at five sites, 166 family units ranging up to five bedrooms at 12 sites, and one lease-to-own, three-bedroom family unit. But perhaps the most significant contribution the Housing Commission makes to affordable housing is through its rental voucher program, Hall said. The commission has more than 1,400 tenant-based vouchers throughout Washtenaw County. The annual budget is about $15 million and $10 million of that is pass-through funds, the vast majority of which go directly to landlords to pay rent subsidies, Hall said. By HUD's definition, affordable housing means a person is paying 30 percent or less of their gross income. Hall said that's particularly difficult for people making less than 50 percent of the Area Median Income because they have less disposable income. According to the National Housing Conference, the Ann Arbor area had the 87th most expensive housing market of 209 metro areas studied last year with a $162,000 median home price. The Ann Arbor area also had the 87th most expensive rental market of 209 metro areas with $882 a month being the fair market rent for a two-bedroom apartment. It appears those statistics are for the entire county, as city officials cite a median home value of $213,000 for Ann Arbor. Hall said the statistics point to a lack of affordability in the Ann Arbor, and the Housing Commission is seeing long wait lists as a result. "We have our voucher program wait list, which we're about to open up this fall, and normally when we open up our wait lists we get three, four, five thousand people apply," Hall said, noting people in the past have been lined up down the street trying to get in. About nine out of 10 people on the Housing Commission's wait list are considered extremely low income, meaning they make less than 30 percent of the Area Median Income. Hall said the local homelessness system of care also is seeing increased demand. A total of 4,738 people in Washtenaw County experienced homelessness in 2010, a 72 percent increase from 2004 levels, according to the Washtenaw Housing Alliance. "On the public housing side, we often call it the housing of last resort," Hall said. "When people aren't able to be successful in other housing, when they get up to our housing, if they can't be successful in our housing, it often ends up being that they become homeless." Hall said there's a growing demand for affordable housing everywhere and Ann Arbor is no exception, but federal support has plummeted. In 1976, HUD's budget was $86.8 billion. In 2010, HUD's budget was $43.6 billion. And those numbers aren't adjusted for inflation. HUD released a study last year that found the nation's 1.2 million public housing units need an estimated $25.6 billion for large-scale repairs to improve basic living conditions. Locally, the Ann Arbor Housing Commission's own study found $14.5 million in deferred capital needs, which equals $40,374 per unit. But the commission is getting less than $500,000 a year from HUD to invest in capital improvements, or about $1,224 per unit. At that rate, Hall said, it would take 33 years to address today's needs, assuming no other repairs are needed in the future. "So that is definitely our biggest crisis, I would say, that we're in right now — the inability to invest in our own properties," Hall said. Marta Manildi, a local attorney and president of the Housing Commission board, told council members there's still a lot of work to do to create desirable affordable housing in Ann Arbor and the city needs to move forward on new strategies. She had choice words for HUD. "HUD is really quite awful as an agency to deal with," she said, citing the amount of red tape involved. "Some of it's arbitrary, some of it's counterproductive, some of it's pointless." Hall said not only is HUD not providing enough capital grant funding, but the amount of rent being charged for public housing is not enough to cover costs of maintaining the aging properties. She pointed to $5,167 in annual revenue per public housing unit compared to $5,304 in expenses. "The revenue that we get per unit is about half of what the private sector gets," she said, pointing out the average monthly rent boils down to $431 for public housing. Hall, who makes $88,000 a year, said another challenge is that the Housing Commission's salaries are some of the lowest in city government. "We recently had a maintenance tech who took a job at the city as a maintenance tech for public services," she said. "He's making $7 an hour more doing the exact same job, but that's because we had to take cuts in our staffing because our HUD funding isn't enough." Hall said the type of tenants that public housing attracts also results in excessive damage to units, including broken windows and holes in walls. She said the commission has issues with security and some sites could benefit from having a security guard. "We have all kinds of tenants with various issues — mental illness, substance abuse, homelessness," she said. "We deal with fist fights, partying, suicides, graffiti. 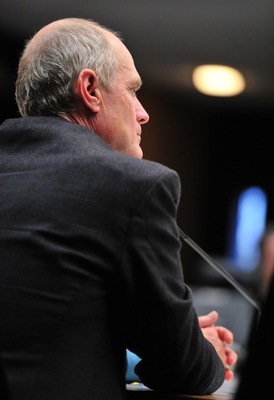 All of these things have happened in the five months that I've been at the Housing Commission." The city hired a company called Schumaker & Co. as a consultant to recommend a new strategic direction for the Housing Commission a few years ago. That report was released in 2010 and the reorganization began with a new board of directors appointed and a new director hired, as well as a new deputy director. Council Member Margie Teall, who joined the board more recently, called it "huge" that the commission has climbed out of troubled status. Mayor John Hieftje, who appointed a mostly all new board for the Housing Commission over the last two years, said he's proud of the changes that have been made. Mayor John Hieftje, who appoints the commission's board, agreed the city has taken some bold steps that have led to positive results. "It really turned things around over there," he said. "Not that the old board wasn't working hard at it, but I think there were some issues there that they were having trouble getting past and the new board came in and has really made some sweeping changes." Hall said the Housing Commission has been doing "all kinds of training" of its staff. She said the commission is working to reduce unit turnaround time to keep vacancy periods shorter and it has worked to increase voucher utilization. Meanwhile, the commission has hired another consultant that will be on site next week to help update all policies and procedures. While the Housing Commission has made great strides, Hall said it needs to start looking at new opportunities, including redevelopment possibilities. The commission's last development included two duplexes in 1998. "There are many housing authorities out there that have demolished obsolete units, they have built new units, they have built units that are tax-credit units like Avalon-type units," she said. "Housing commissions can do that. They can convert their own units to those kinds of units." Hall said there's also a new competitive program where HUD is trying to get 60,000 public housing units converted to project-based vouchers. "We are going to figure out which properties we want to do that to and prioritize and do some conversions," she said, pointing out the average public housing subsidy in 2011 was $527 per unit per month, while vouchers brought in $807 per unit per month. "And so if we take our public housing and convert it to a voucher program, we actually will generate more revenue for the exact same units, the exact same tenants," Hall said, adding that extra revenue can be spent on hiring more staff and doing more maintenance. Council Member Sabra Briere, D-1st Ward, said she'd like to see a plan for addressing the current maintenance needs. Hall said she'd ideally like to hire one or two more maintenance workers, a social worker to handle intake work and an administrative assistant. "But I don't have the funding," she said. Council Member Stephen Kunselman, D-3rd Ward, asked if the Housing Commission is restricted from using volunteers to help tackle some of the needs. Hall said the commission isn't restricted from using volunteers for certain activities and she's in talks with Eastern Michigan University about tapping the skills of construction management students to do some specific projects. She also said the commission is considering a program where tenants themselves could make some extra money to do work. Wed, Apr 11, 2012 : 2:58 p.m.
Congratulations to the Housing Commission on its recent big achievements. It's dilemma is, however, an unfortunate example of the tradeoff when a government agency enjoys the benefits of public funding but is shackled by red tape and a lack of entrepreneurial energy. What if some of the commission's efforts were to go into exploring creative approaches that could change the way business is done and perhaps improve outcomes beyond expectations? Just from a reading of the article, several possibilities spring to mind that might be worth looking into. For example: Exploring partnerships with various departments at U of M such as Urban Planning, the School of Social Work, the Business School, etc. Social Work students could assist in obtaining grant funding and providing support services; business students, many of whom preach and practice corporate social responsibility, could help re-engineer processes and training so more of the funding dollars can go to housing and services. Bring someone on board with experience at coordinating volunteers so capable and willing people like &quot;Toothless Wonder&quot; can make the contributions that are badly needed. If federal regulations allow, charge &quot;hours of service&quot; along with the monthly rent, so the residences operate more like a co-op. Since many of the residents may have disabilities or other kinds of restrictions, the contributions could be handled creatively. Some can do repairs, sure, but others perhaps could participate in fundraising activities, check in on the home-bound, edit a resident newsletter, or the like. Systematically benchmark other affordable housing organizations in cities with similar demographics. What can be learned from them? Two separate references in the article cite Avalon Housing as a local nonprofit group offering similar services and, apparently, doing a better job of it. Which of their policies, processes, etc. would help the housing commission if adopted or adapted? Wed, Apr 11, 2012 : 8:32 p.m. There are more resources and organizations willing to help and provide knowledgeable assistance in Ann Arbor than in most cities. What you don't get is that no matter what resources are available it is a two way street and those caught up in the multi-generational debacle of public housing in Ann Arbor also need to want to change. Some may but proof is in the pudding. Wed, Apr 11, 2012 : 12:38 p.m. Wed, Apr 11, 2012 : 8:25 p.m.
To invest any more money in some of these units is a total waste. Millions over the years have been spent to keep the units habitable. Unfortunately it does not take long for the tenants to trash any improvements undertaken. Not sure what todays standards are but know specifically that it used to be virtually impossible to evict troublesome tenants. The HC units are probably the highest cost per unit rentals in the city. No sane investor would ever take these on and no sane taxpayer would ever vote for a millage to improve the units. Wed, Apr 11, 2012 : 11:34 a.m. Isn't anyone out there (including the Mayor and Council and all the pundits) going to say to Jennifer Hall: &quot;Thanks! Good work for taking on an impossible job, minimal staff, ridiculously low budget, troubled clients, and still managing to get out of &quot;troubled status?&quot; OK. I will. Good Job, Jennifer Hall. Now if you can just get a little real support beyond lip service from City Hall and HUD, maybe you can continue before you burn out and throw in the towel. Granted this is just the first step. But it is a huge one, considering the previous deterioration under the previous Director and Commission and the lack of staff and resources. Everyone is so quick to criticize but slow to praise. Let's give a competent administrator credit, and give her the RESOURCES to do the job. Wed, Apr 11, 2012 : 5:48 a.m.
My last sentence should read: Of course they buy our votes with promises of &quot;endless tax cuts&quot; which end up being mostly for the wealthiest. The software here told me I had 40+ words remaining -- I didn't. Wed, Apr 11, 2012 : 5:36 a.m. Wed, Apr 11, 2012 : 4:52 a.m. Wed, Apr 11, 2012 : 12:21 a.m. The HC has been cesspool of mismanagement for decades. Over the years millions have been spent to rehab units regularly destroyed by tenants that usually are not held accountable. No secret the city owns and manages the worst housing in the city. This has been the case since the public housing was built. The best and only cost effective approach is the rental voucher program. Give the tenant the ability to find living space in the open market. Quit spending good money on units that have over time cost multiple thousands since they were built. Wed, Apr 11, 2012 : 12:17 a.m. Wed, Apr 11, 2012 : 12:17 p.m. I guess the Housing Commission can still improve even though HUD no longer considers it in &quot;troubled&quot; status. Tue, Apr 10, 2012 : 10:38 p.m.
Tue, Apr 10, 2012 : 10:31 p.m.
&quot;The revenue that we get per unit is about half of what the private sector gets,&quot; she said, pointing out the average monthly rent boils down to $431 for public housing. A2 Housing needs to consider: They aren't subject (to my knowledge) to city property tax. The tax burden amounts to 20 % +/- an investor subtracts from his gross. Their finance burden, if it exists, isn't accounted for per unit. An investors is. The Housing Comm. admin. inc/cost ratio, per unit is unsustainable. One third of income is expensed to admin.. No surprise it's broken. Surprise is, it's improving! Tue, Apr 10, 2012 : 7:50 p.m.
Mayor John Hieftje, takes credit for everything, the blame for nothing. Tue, Apr 10, 2012 : 7:47 p.m.
&quot;Mayor John Hieftje, who appoints the commission's board, agreed the city has taken some bold steps that have led to positive results.&quot; So who was Mayor for ten years while the Housing Commission fell apart? Guess the Mayor was busy with other things, like guarding the Urinal Water Fountain and protecting it from protestors? Or walking his dog in the Arb and meeting with DTE officials? Tue, Apr 10, 2012 : 7:44 p.m.
Housing costs in Ann Arbor, from the statistics stated in the article, are solidly in the middle. Plus there is a lot of support for low income housing in the area what with the city Housing Commission and Avalon Housing. So how did the housing stock get in such bad shape and how did the previous housing commission do such a bad job. The director and board apparently let the city and its residents down. The city must not have kept close enough tabs on things. As for the housing stock being damaged so badly by the tenants, maybe there needs to be a policy of dealing more effectively with tenants who abuse the properties.You abuse the property, you are evicted promptly and lose the right to rent through the program. Tue, Apr 10, 2012 : 7:32 p.m. Frankly, I'm not all that sure what the benefit of subsidizing the housing on people who cannot afford it is. If a person does not have the means to live in Ann Arbor, they should not be living in Ann Arbor. Besides, Ypsi isn't a bad place to live at all. Tue, Apr 10, 2012 : 7:33 p.m.
Tue, Apr 10, 2012 : 6:59 p.m.
City government for the past decade, if not more, has had less than zero interest in affordable housing in either the legal or the general sense. Most of Ann Arbor's rental laws and zoning/transportation policy are oriented around pushing working class and poor people into Ypsi and the townships. No surprise the HC isn't in good shape.